A crazy thing happened last week: I was featured on WordPress’ Freshly Pressed page! 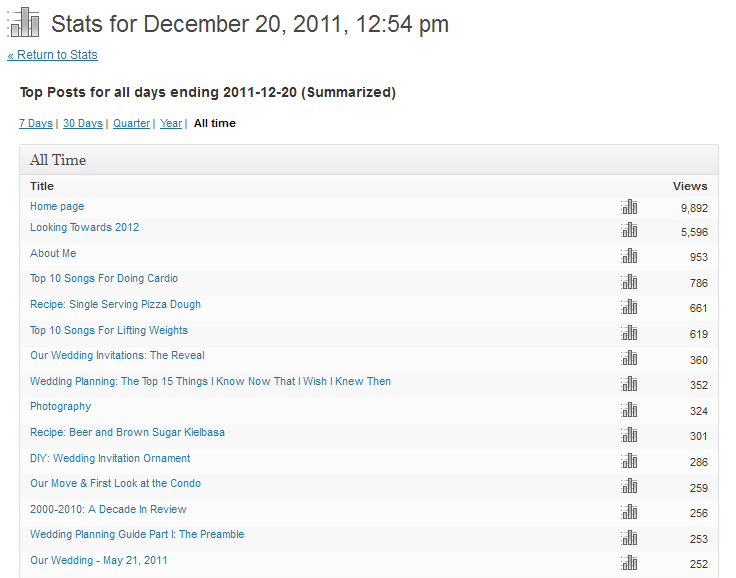 Well, one specific blog post I wrote was featured: my Looking Towards 2012 post. Freshly Pressed picks their featured posts based on original content, appealing visuals, and the discussion of a compelling topic. They describe Freshly Pressed as “the best of 376,678 bloggers, 728,045 new posts, 431,141 comments, & 148,378,384 words.” Humbling! Freshly Pressed posts are usually up for a day or two. My post was on Freshly Pressed for 7 days! Needless to say, I got a lot of traffic. The numbers were so staggering, and unlike any activity I’d ever seen on my blog before, I didn’t really comprehend how huge this was while it was happening. But yesterday I ran all of the stats. (I don’t talk about it much here but in real life I work in Higher Ed doing Institutional Research so stats are kind of my thing.) Let’s talk numbers, shall we? Below is a graph of the hits my blog received in the days leading up to, and then during, being Freshly Pressed. The high reached 2,194 hits in one day. For the days that I was Freshly Pressed my blog saw a +713.65% change in activity (jumping from 1,000 total views from the week prior to 8,283 for this week). Domestocrat was viewed 9,518 individual times over the last 7 days compared to my 39,864 blog views of all time. My blog also gained 82 brand new followers from this visibility. The individual hits to my Looking Towards 2012 post are second only to my home page which has received 9,892 individual hits over time (you can see my top posts sorted by views below). I am without words to express how exciting and amazing this experience has been for me. To be recognized for a post I thought about deleting several times seems unreal. I am so grateful to everyone, new and not so new, who read what I write. I know photog/foodie/DIY/traveling/every day bloggers are a dime a dozen. I work really hard to write posts that are original, unique, fun, and that are told visually with photographs. I will never compromise that about this blog. I hope all of the newcomers will follow me into the new year and that my existing followers find my new content to be even better than what brought them here in the first place. I really think 2012 is going to be great. I have so many ideas and new things I want to share, and I can’t wait to get started. So thank you, truly. I blog for me but it would never be this rewarding without you. Thank you. This gives me some hope! Congrats and thanks. Congrats Kim!!! So deserved :) Whether it’s your recipes, travel stories, or DIY projects – I always get this feeling of “you know what? I can do that!” after reading your posts. You make everything look beautiful, fun, but also manageable! And gotta love those WordPress stats! Hope 2012 brings many more followers! Thank you for the kind words and for supporting my blog, Jenny! Hope 2012 brings many good things to HFOP and HOPF too! Might i suggest (if you haven’t already set a mental reminder) a similar post 6 months out where you look back and see what the extra exposure meant to ongoing readership.